Welcome back chess fans – it’s been a while since our last Puzzle #008, way back in December. Pleased to say we have a winner from that round in the form of Carsten, our Great Dane. Congratulations Mr Pedersen! This week’s puzzle comes courtesy of Carsten, and it’s straight out of a London 4 match v Wanstead last week. Hammer’s John Ryan had completely outplayed his opponent and managed to bury his opponents Queen on h8! Unfortunately from this position he missed a very flashy win, and later ended up losing on time in a better position – painful!! It was sadly typical of the match, where Hammer lost 5-3, despite having been comfortably ahead on most boards (read about it here)! If then fxg6, pawn advances with check, then Kf8, then Qxg6, h7xg6, Rxh8 winning the queen back and bishop back. yes, JW’s line is winning easily. 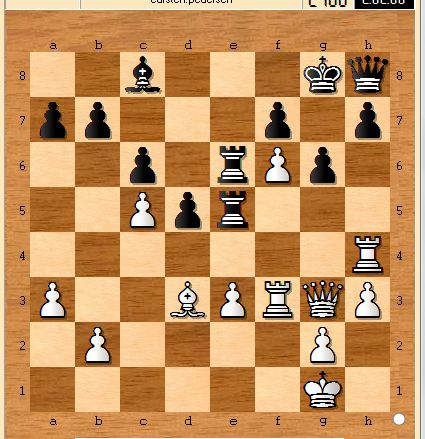 I suppose after Bxg6 Kf8; Rxh7 Qxh7; Bxh7 Black might survive a little longer but not much.